Now more than 900 operators are in the vetting system available for you. Furthermore we added two new parameters, we now display all the serious incidents an airline has got over a period of 2 and 10 years. 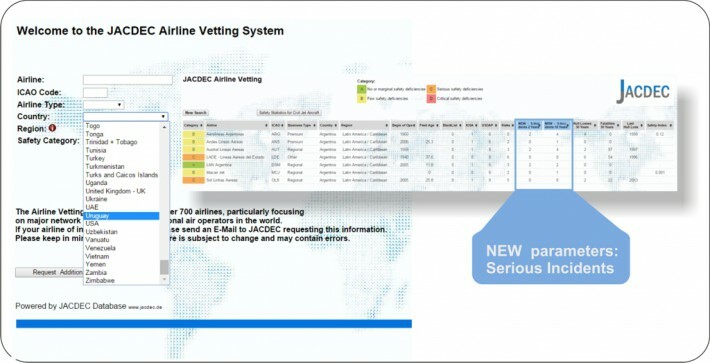 JACDEC has launched the Vetting Service in 2013. A growing number of customers benefits from an up-to-date analysis of virtually every commercial passenger airline on the planet. All search results are displayed at a glance without shifting bewteen windows. The vetting is very easy to handle and the data complexity is quite clear. All key safety parameters of an airline are displayed in the Vetting System pus an overall assessment from „A“ (best) to „D“ (worst). The Vetting is constantly held up-to-date whenever new information became available. For travel agents, risk managers but also for anyone interested in safe air-travel, this tool is vital to make reliable decisions for flight bookings. Vetting System Upgrade. Now Serious incidents Included. Fed by Jacdec Database updates on a daily basis. 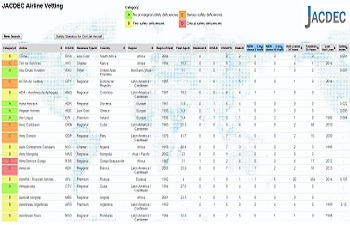 Each single airline, country or region can be displayed seperately. Combined your search with multi-filters or sort each parameter seperately. Test it out for free. Interested ? Make use of our 24 h free trial access.